Previously on The Bachelor: In an unprecedented twist, M. Coquelet, our current little rooster, eliminated every eligible special someone. Though successful, sincere, emotionally secure, educated and accomplished, impressive, attractive and alluring, appropriately desperate (yet not suicidal), Britney, Tabitha, Amanda, Helene, Jennifer, Kristen, Brooke, Jessica, Tara, Sarah, Sadie, Tessa, Chelsea, Molly, and Vienna were each given their walking papers and left a trail of tears as the final credits rolled, each withheld rose a slap in the face. There's just no pleasing some men. 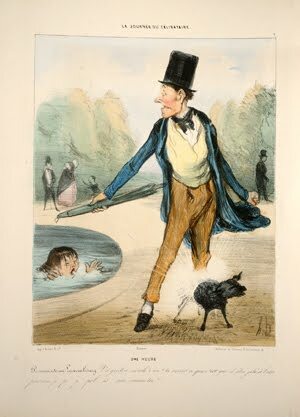 And so in this episode of The Bachelor we follow M. Coquelet, smug and satisfied in his narrow little world, all alone with his pets, following his arid routine, and denying the loneliness that rises up when his guard is down. It's boring television but the producers have put together a commemorative album to chronicle this sad affair of a man too stupid to know how empty his life is and blind to the solution just a single, long-stemmed rose away. Plate One. 7 HEURES DU MATIN. 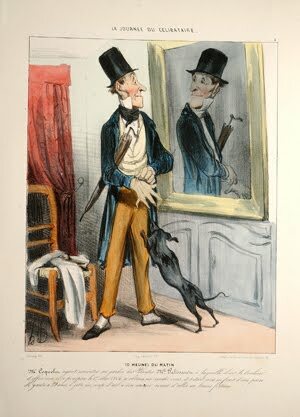 Réveil de Mr. Coquelet. Mr. Coquelet souris à cette touchante rivalité. Minette and Azor dispute Mr. Cockerel's paternal kiss as if rivals for a mouse). et le chant du.... serins. The series was soon published in black and white in a separate album offered for twelve Francs and in color for eighteen Francs. 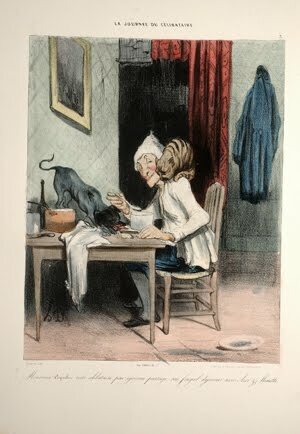 The album was printed by Chez Aubert and edited by print-seller Chez Bauger, Paris, and advertised in Le Charivari on November 5, 1839.
son frugal déjeuner avec Azor et Minette. There are no copies noted in OCLC or KVK. It is considered to be quite rare. son miroir avant d'aller en bonne fortune. 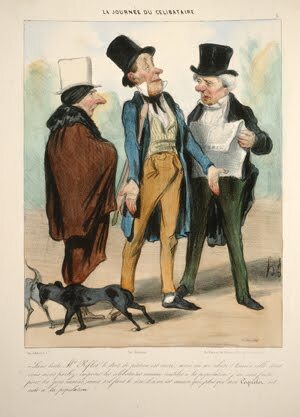 "Daumier had some experience with bachelorhood himself, since he married the seamstress Alexandrine Dassy only at the age of 31. 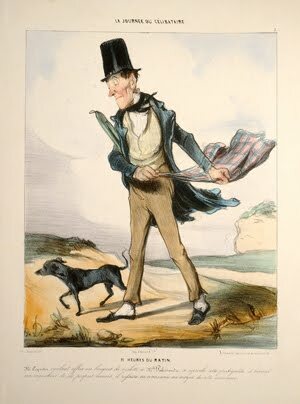 In contrast to his fictitious personality, Monsieur Coquelet, he had however decided for marriage, while Coquelet lived a life of stinginess and loneliness, diligently avoiding any permanent relationship. Plate Six. Sans doute Mr. Riflot le droit de pétition est sacré; mais on en abuse! en est aucun qui, plus que moi Coquelet, ait aidé à la population. (Doubtless Mr. Riflot, the right of petition is sacred, but it is abused! 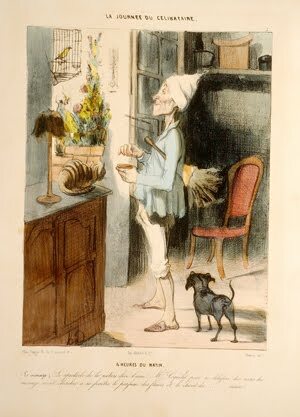 "Daumier not only chastises the loneliness of his bachelor's existence but even more so his avarice and makes him appear ridiculous in his exaggerated affection for his pets, usually an over-fed dog, cat, canary or occasionally a plant on the window sill. 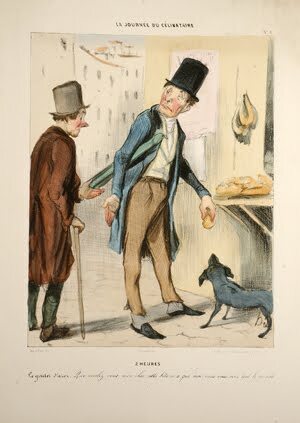 With a somewhat melancholy smile, the reader recognizes these insufficient substitutes for real love and partnership and the waste led by a life diligently governed by a daily routine which starts at 7 in the morning and ends at 9 at night, leaving no room for personal deployment and deplores the waste of precious time" (Daumier Registry). par un p...p...p...pol...is...son comme toi!! cette bête n'a que moi, vous, vous avez tout le monde. dmire cette institution qui met à l'abri des audacieuses entreprises d'êtres corrompus. the institution that protects from aggressive firms becoming corrupt). et vous un vieux tricheur. and you an old cheater). Plate eleven sees Coquelet at seven in the evening walking home. He meets a friend who tells him.... "A word! My dear, in all honor, a neighbor, 45 years, pleasant little widow, and the heart has nothing to do ....)." Coquelet keeps walking. 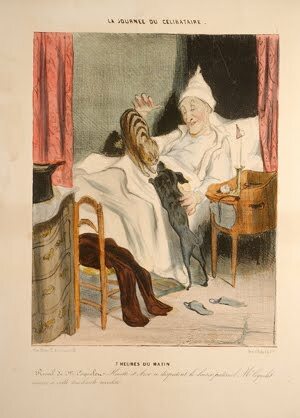 Plate twelve ends M. Coquelet's day at nine at night. "Mr. Cockerel extinguishes the light on a day that ends like the day before and traces the exact picture of the single life!" "I could have had Betty. I could have had Carole. Instead, I'm trapped in a ménage à trois from hell with me, myself, and I! 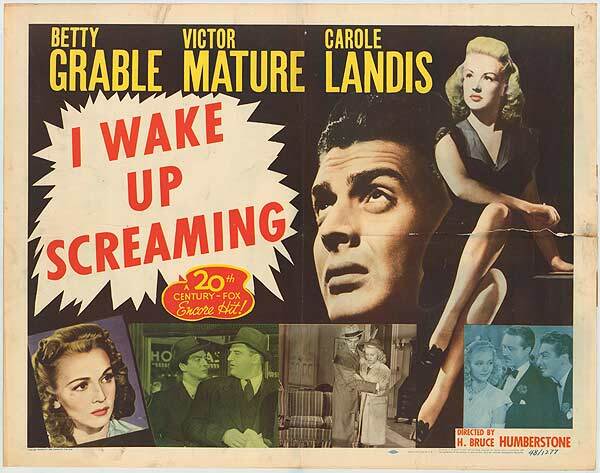 I made my bed and now I have to sleep in it, solitary in a fool's paradise! 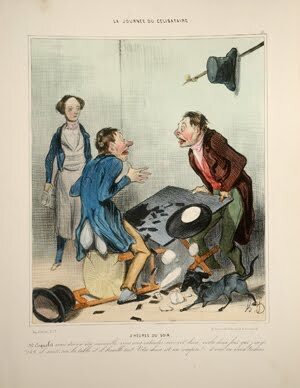 Damn you to hell, Daumier! Damn you to hell!" And so ends this episode of The Bachelor. 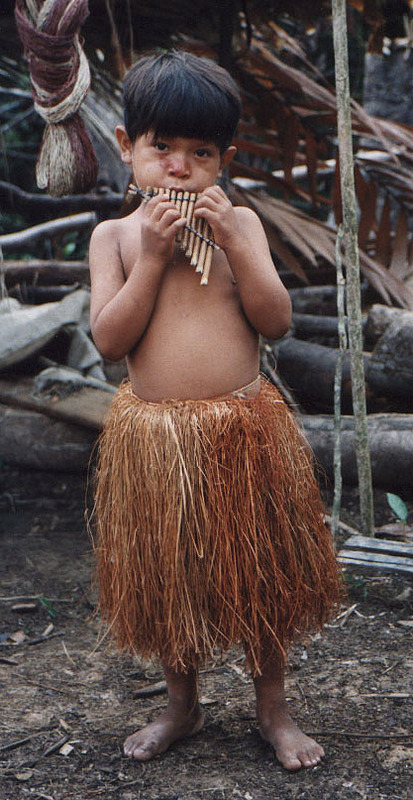 Next week on The Bachelor: Brad, a precocious lil' satyr from Covina, California, plays the Pan pipes to a bevy of fine lil' dogies culled from a recent cattle call. Eligible, buff, and stylish. Yet unemployed. Who'll be the lucky lady? 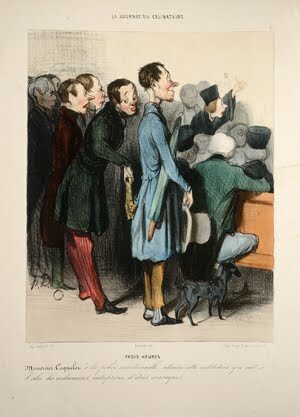 DAUMIER, Honoré. La Journee du Celibataire. [Paris: Aubert & Cie, 1839]. First issue. Folio. Twelve hand-colored lithograph plates, 13 5/8 x 10 7/16 in., (348 x 266 mm. ), plate; 9 7/8 x 7 3/4 in. (250 x 197 mm. ), image, heightened with gum arabic. Three edges gilt. Daumier images courtesy of David Brass. New Trend For Signing Books: Autograph In Blood! Hey, Rare Book Guy: What's "Parrish Condition?" Book News Notes From The ABA -U.K.
A Book Marketing Ploy Worthy of "Mad Men"